The colossal temple of Lord Jagannath in Puri is greatly visited by many devotees from every corner of the World. The shrine built by Anangabhimadev is a holy place that enshrines the Lord of Universe. It is one of the Chaar Dhaams meaning four most sacred places of India, the other three being the Rameswaram in South India, Dwaraka in West India and Badrinath in the Himalayas. 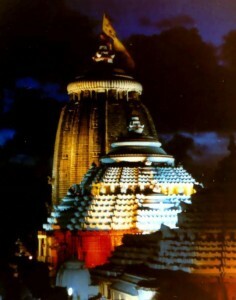 The devotees believe to complete their pilgrimage with their visit to Puri. The huge deities are made of the neem wood and also known as Daaru Brahma. The Lord Jagannath rules the universe with his brother Lord Balabhadra and Devi Subhadra. It is the only incarnation where the Lord is worshipped with his brother and sister. The temple is believed to follow the Orissan architecture. It has the four vertical divisions like the Orissan temple architecture and it acquires Pitha (Pedestal), Bada (Wall), Gandi (trunk) and Mastaka (head). The major portion of the pedestal of the temple is buried and less part is visible. This makes the temple stronger and is capable of resisting all natural calamities. From horizontal point of view the temple consists of four structures. First is the Bada Deula, second is the Mukhasala, third is the Natamandir, and fourth is the Bhogamandap. The tall structure of the shrine is well controlled by this style of architecture. The shrine is 214ft tall and the total area of the temple is built within an area of 10.7 acres. The shrine is surrounded by two walls, one is known as the inner wall or the Kurmabedha and the outer wall is known as the Meghananda Prachir. The temple has four entrances. The eastern entrance is known as the Singhadwara or the lion gate, the western gate is known as the Vyaghradwara or the tiger gate, the northern is known Hastidwara or the Elephant gate and the southern gate is the Horse gate or the Aswadwara. There is a wheel on the top of Puri Jagannath Temple and it is well known as Neela Chakra. It has huge importance in different occasions and festivals. On the Ekadashi tithi a lamp is lit near this Neela Chakra. Seeing the Holy chakra and the flag known as “Patita Paawan baana” cleanses the sin of many births. There come a lot of festivals and rituals of Lord Jagannath every year. Throughout the year one will get every kind of festival in the temple. The famous one is the Rath Yatra or the Car Festival. On this sacred day the three deities descend from the Ratna Sighasan and ascend on their individual car to visit their Aunt “Ardhaseni”. The cars or the rathas are properly decorated to welcome the deities. This festival symbolizes the relationship with the kith and kin. With the observation of strict rituals the deities ascend on the Rath. This occasion has a great secular implication. When the Lord is on the Car, irrespective of caste and creed the devotees can touch and worship him which is not allowed on any other day within the temple. This day establishes great equality and secularism within Hinduism. Tourists can visit the temple on any day of the year to enjoy the great architectural work and the festivals of Lord Jagannath. The visit to this place on any day makes the day special with the remarkable and delicious “Prasada” of the Lord.